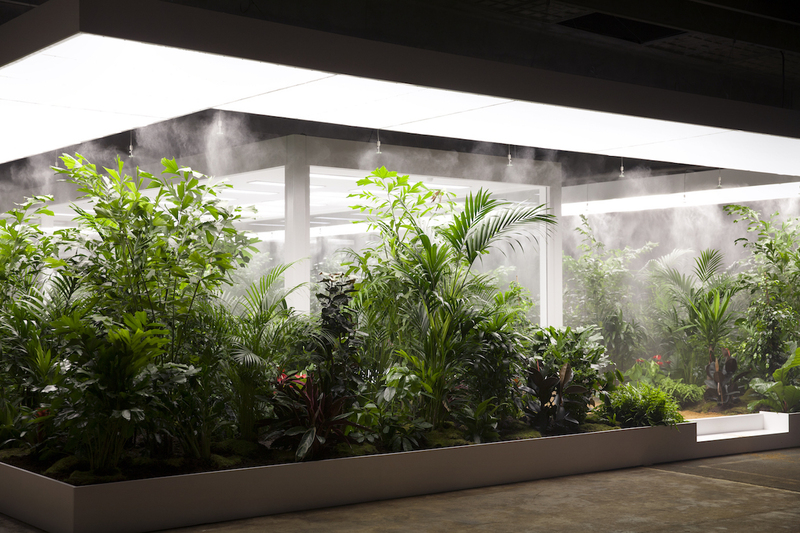 The artist offers a verdant course in anger management at a Denmark museum. 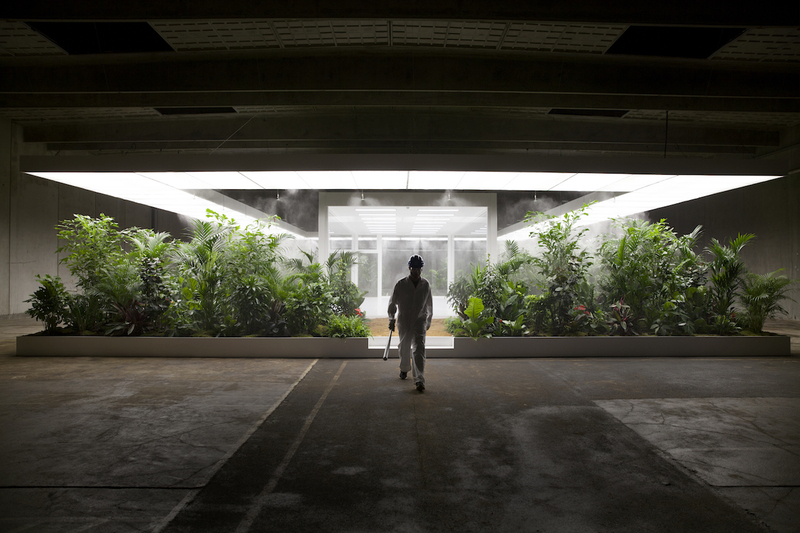 Earlier this year Doug Aitken debuted “Mirage,” a site-specific installation in California’s Palisades Desert. The structure, an all-mirrored house, reflects the landscape’s vegetation—shrubs, rocks, and sand—creating a fluid relationship between the man-made and the natural. In his latest work, “The Garden,” the artist continues to explore the dichotomy between these two environments—this time, with a big stick. 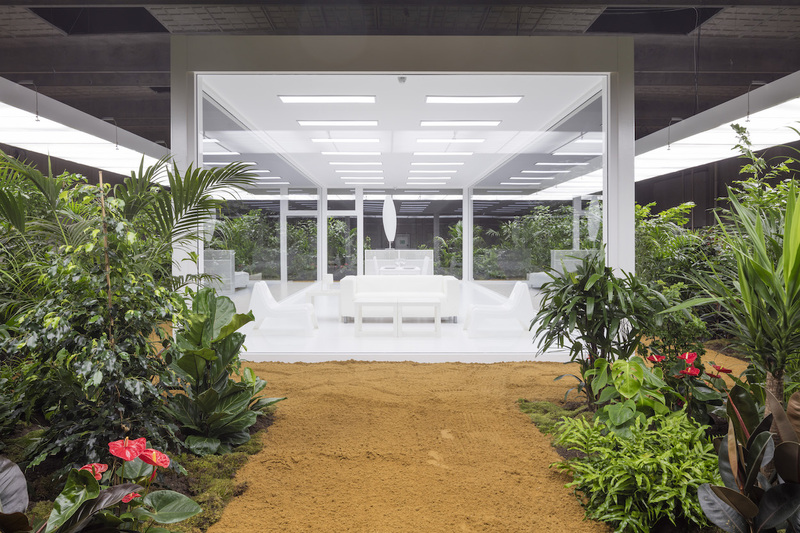 Inside an industrial warehouse, viewers are greeted by a tropical garden surrounding a bulletproof glass room with modern furniture: chairs, beds, and tables. The installation is activated by the viewer, who is invited to spend 10 minutes in the cube with a baton. Once inside, they are free to release their emotions by banging, smashing, and breaking any object in sight. Their rage becomes the center-piece of the installation, as the audience on the other side of the glass gathers to watch the destruction at play. In this way, the room functions as a sort of voyeuristic anger chamber. “It’s a release of and from the modern environment” explains Aitken. “This project fuses nature with a sterilized modernized environment and breaks down the barriers between nature and mechanization.” Aitken’s installation is part of the first ARoS Triennial at the Aarhus Art Museum in Denmark, which in this edition explores the past, present, and future through the relationship between man and nature. It will be on view through July 30.